This Mother’s Day was a real miracle, from the moment I was commissioned to create these “Jars of Love,” to the hour we spent delivering them. To all those who donated your money or time, you are part of this incredible story of giving! 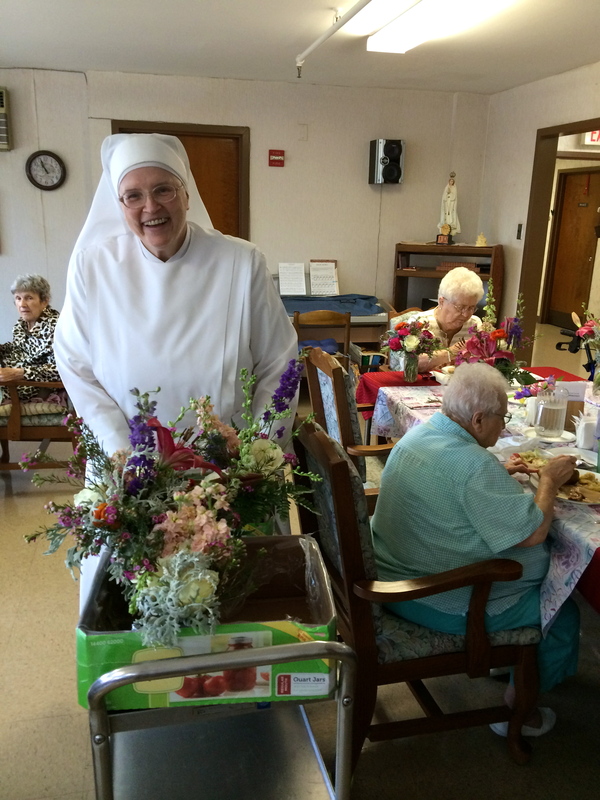 A couple weeks ago, Emily Malloy of falls flowers was contacted by the Little Sisters of the Poor. 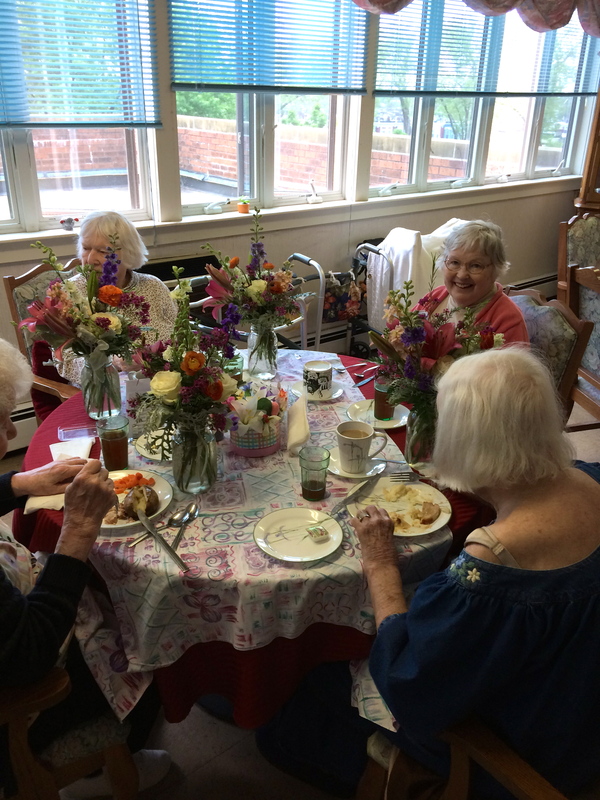 They were looking to get Mother’s Day floral designs for the low-income, high-risk residents of Holy Family Home, an assisted living facility in Philadelphia, PA. 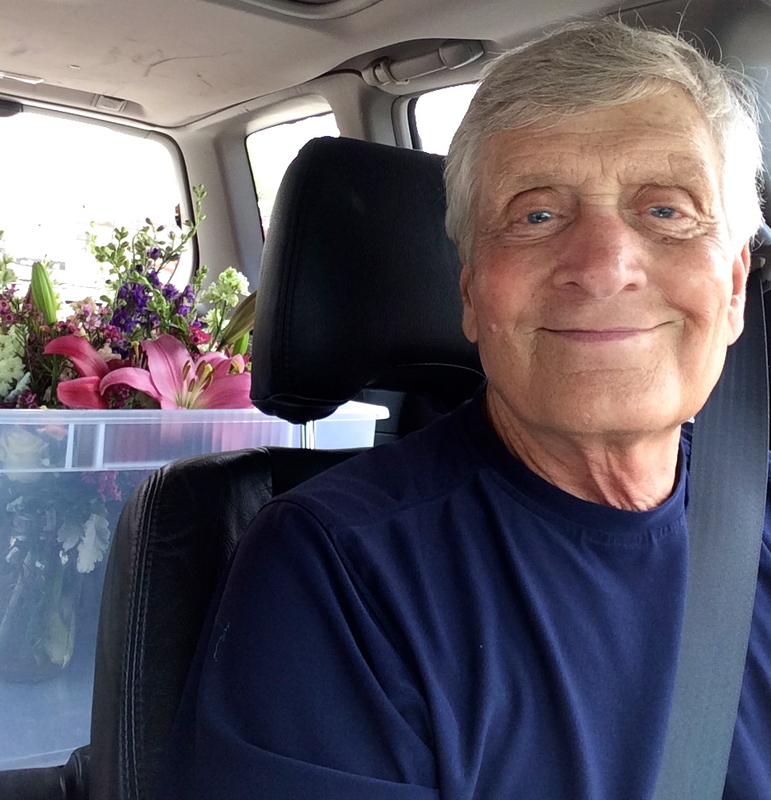 When the shop was unable to accommodate the request due to the high volume of Mother’s Day, Peicha, the owner of falls flowers, contacted me. (I used to work there and do freelance work now.) A few email chains later, and we realized that there really was not enough money in the budget for what they were asking for. 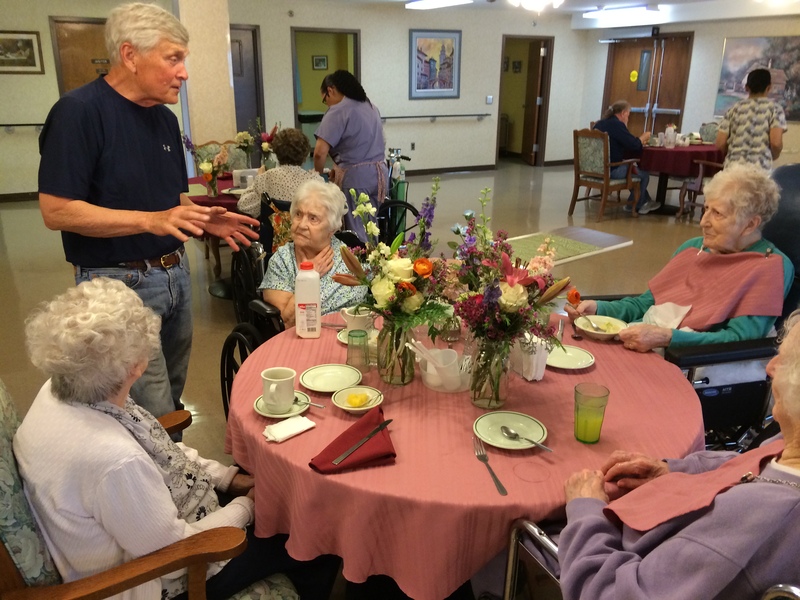 So – sitting at home on my couch later that night, wishing I really could do this work, an idea came to me: we could just raise the money through social networking, and then the residents would get their flowers for Mother’s Day! Peicha and Emily pitched in, and with the help of our families and friends, we ended up raising $988 – more than what was needed for the wrist corsages they wanted!! 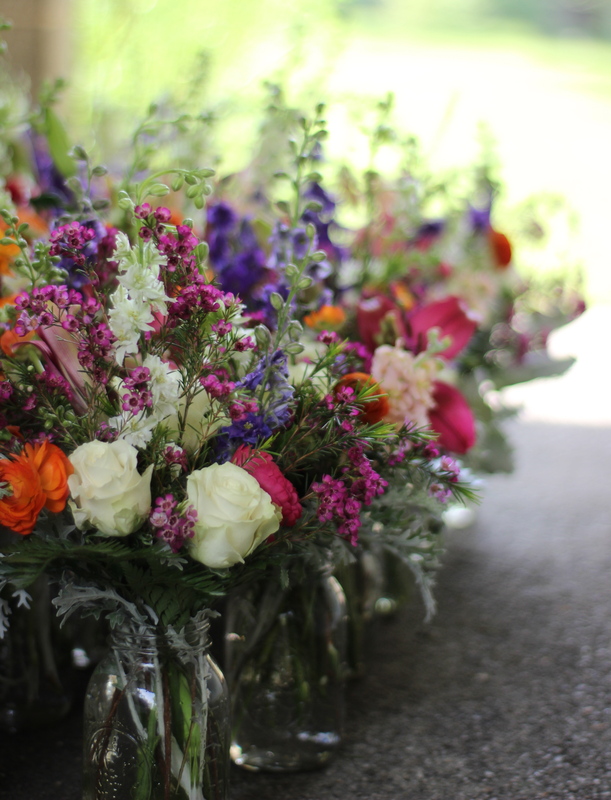 So the plan changed to create 50 mason jars filled with a lovely assortment of floral material. And I had a lot of work to do. After picking up materials through Peicha’s wholesale connection, the 50 Jars of Love were completed over two days. When it was nearing time to deliver, I got a call from the home – there was a miscommunication along the way, and they needed 80 designs, not 50! Uh oh. I had been meditating earlier that morning and decided my mantra for the day was to “be in the moment.” Well, for the next hour while I divided materials out of the completed designs to create 30 more, there was nowhere else to be! This is where some angels came in and made the rest of the story happen. Todd and his son Ryan flew in from above to help load and deliver designs – THANK YOU!!! Riding in our little caravan on the way to Holy Family Home, my Dad and I singing along to old songs, with Todd and his son Ryan following behind us in their fabulously huge vehicle, I knew the best part of all was about to happen. When we arrived we were greeted by the smiling faces of the Sisters of the Poor, including Elizabeth Ann who hails from the Boston area. 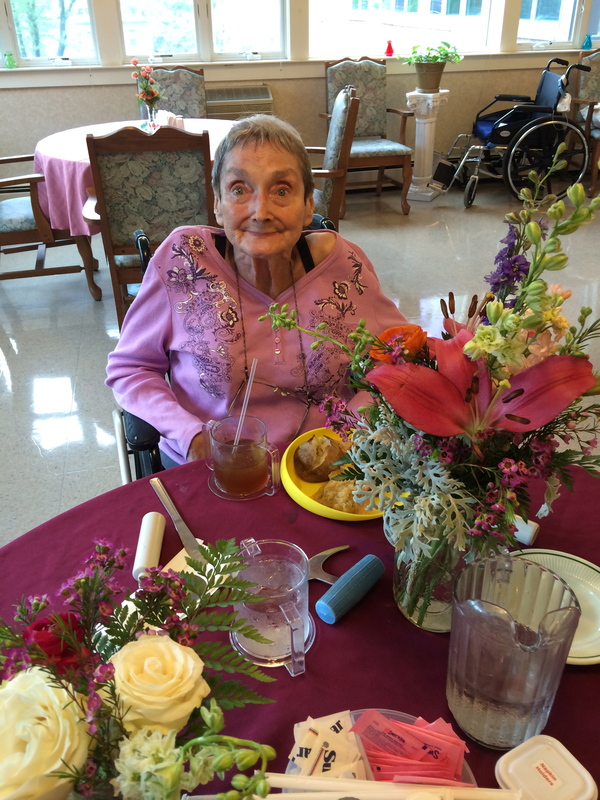 She got us carts and we made the trip up the elevator to stop at every floor and give out our floral jars to the residents while they were eating lunch. There are many people to thank for their generosity in making our charity project happen, including Todd, Ryan, my Dad, Peicha, Emily, and all of our donors (last names omitted for privacy): Motria L., Aaron B., Elizabeth C., Shannon O., Jen S., Amy K., Walter B., Emily M., Carolyn D., Josh L., Lise N., Mandy G., Mary F., Emily M., Vincent T., Jason H., Joseph K., Michael B., Joseph K., Amy K. (2nd time! ), and Rebecca M., Penny B., Julie S., Dan B., Eunice F, Elvira G., and Sandy F. I should also thank my own mother who was an example of giving. 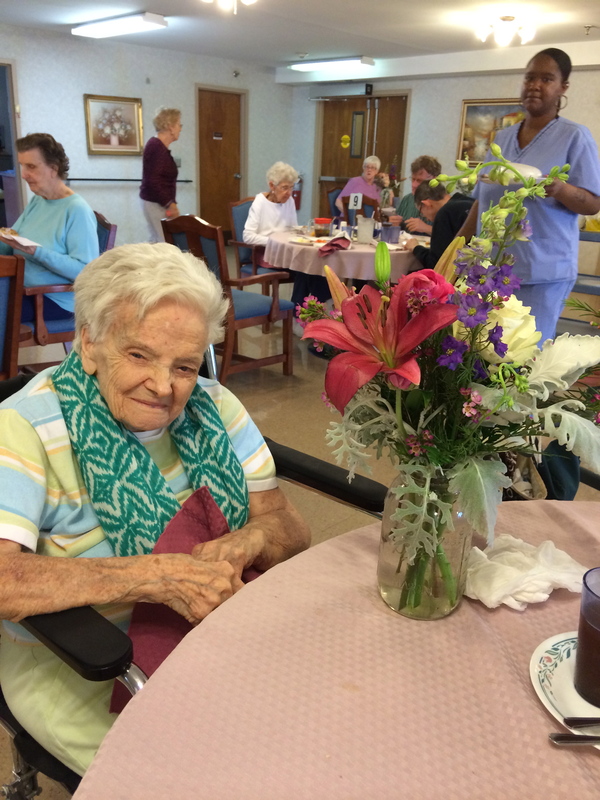 I think she would be happy that we did good for the ladies at Holy Family Home. 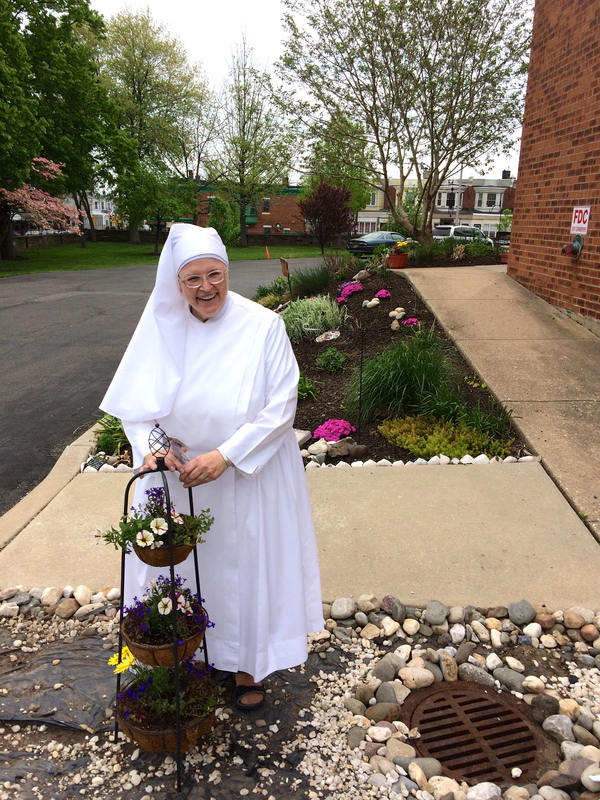 Sister Elizabeth Ann and her “gah-den” – COME VISIT ANYTIME! This could be an annual tradition, don’t you think? Let’s do it again next year. Happy Mother’s Day to all! 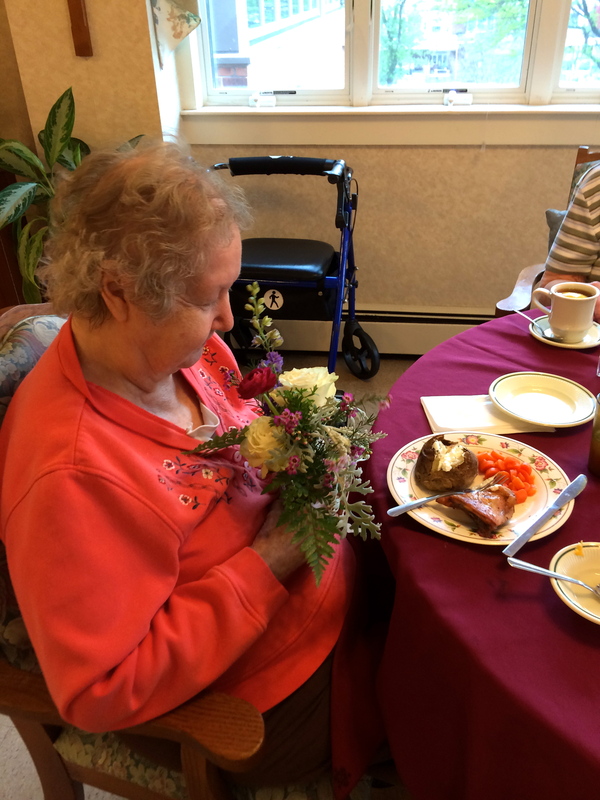 This entry was posted in Floral Design, Flowers, Philadelphia and tagged Donating Floral Designs, Falls Flowers, Good Cause, Holy Family Home, Mason Jars, Mother's Day, Mother's Day Flowers, Sisters of the Poor by Ann. Bookmark the permalink. 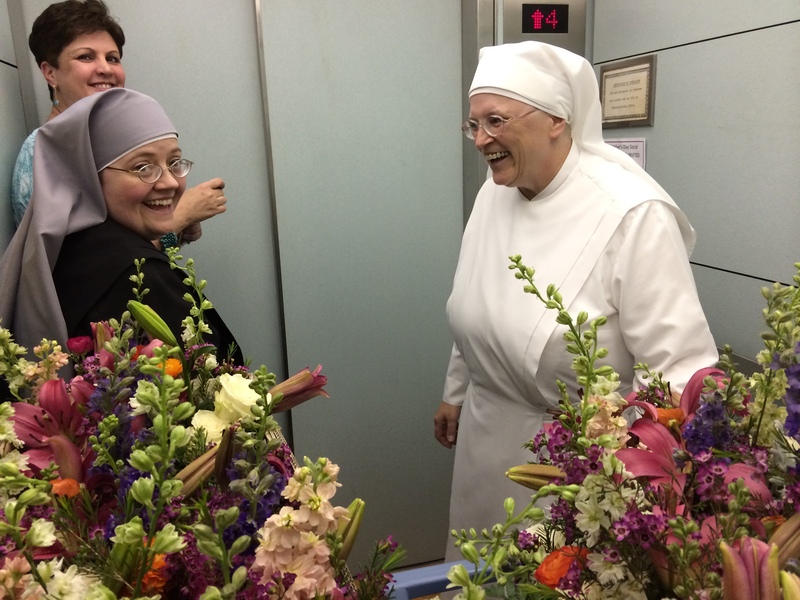 As we began to unload the flowers – box after box – the Sisters’ faces lit up. I am absolutely certain that they did not expect what AnnieMac had wrought. 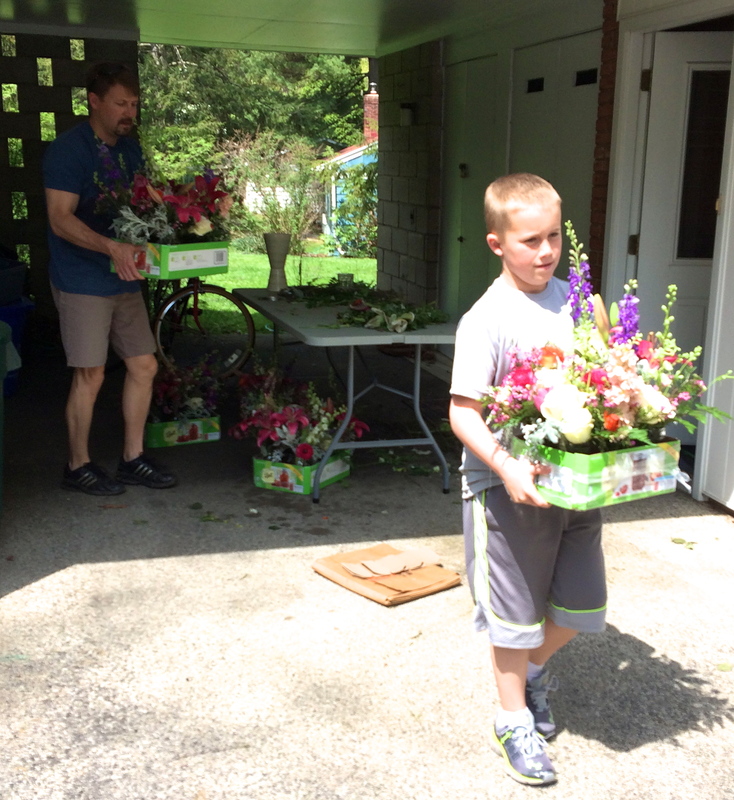 To take 50 arrangements and (in one hour!) make them into 80 – well, it seemed positively biblical to me (remember the loaves and fishes story?) 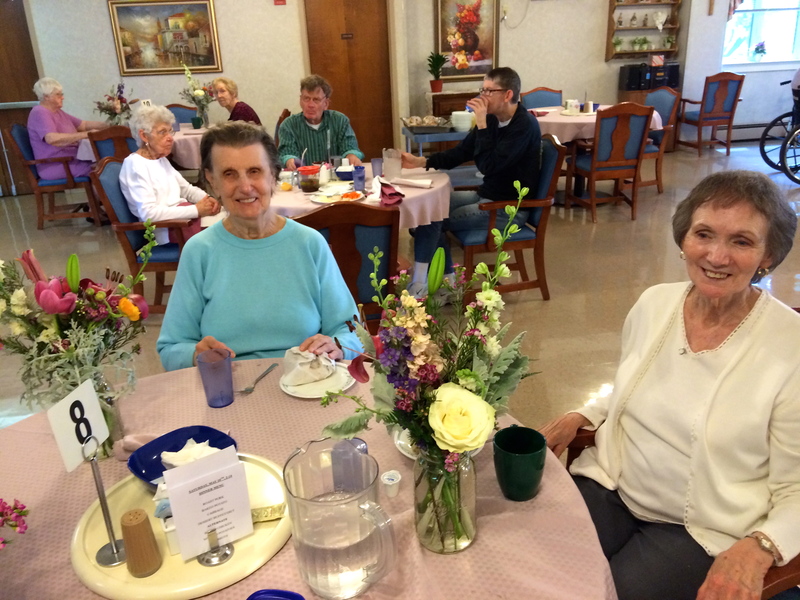 Then the dining room(s) hand outs by Sisters, Ann, Todd and Ryan was undoubtedly the highlight of the year for the recipients – all very elderly women, many with great smiles. A great day all around! My mother is a resident at Holy Family. 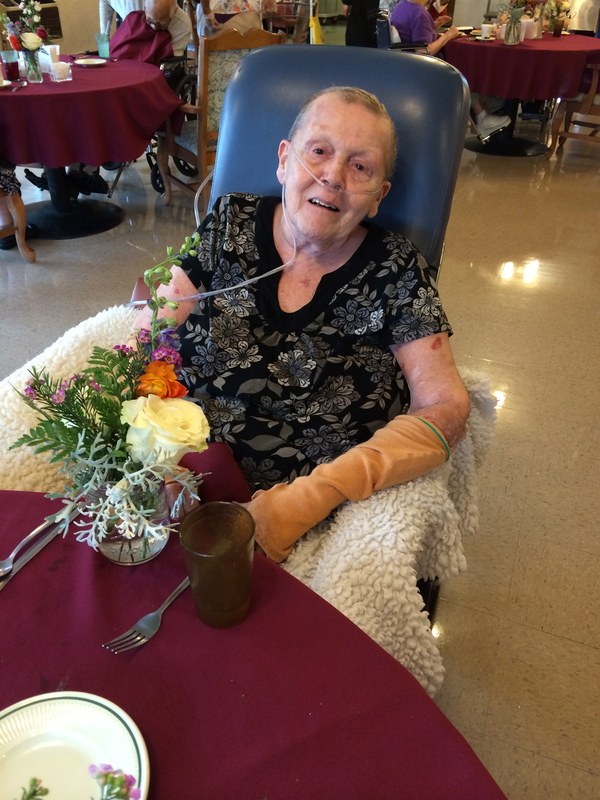 When I arrived at her room on Mother’s Day, the first thing I saw was that beautiful vase of flowers. I thought a relative had sent it, when I noticed that everyone had one. How wonderful of you to do such a lovely thing!!! Thank you so much for giving so much pleasure to so many. You’re welcome Kate! It was entirely my pleasure. And I’m glad you got to see your mother on Mothers Day! This is such a lovely story. 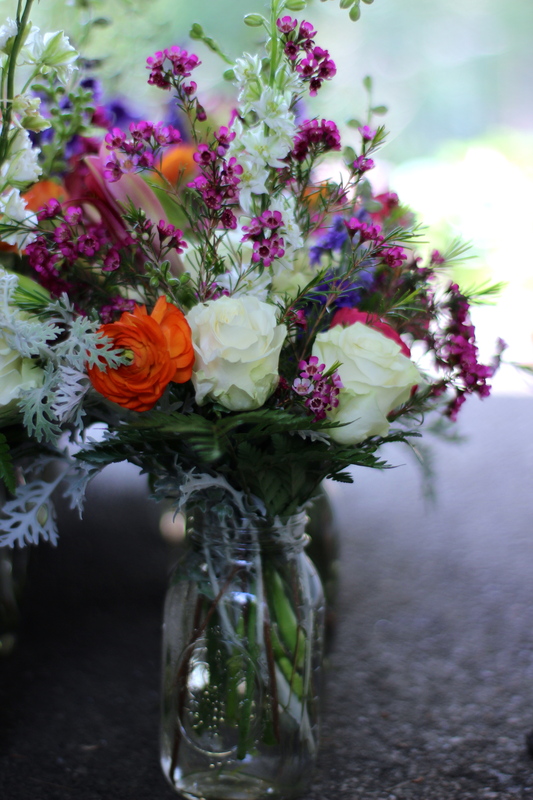 The bouquets are just gorgeous and the smiles on everyone’s faces are priceless.